A recent study, published in Nature Genetics, has found an interesting new link between the F-word and metastatic prostate cancer. Before you let your imagination run wild, this is not the four-letter F-word but the other F-word — fat. Fat is an important constituent of all living cells, as it is a critical component of the outer layer that surrounds individual cells. Historically, fat has long had a love-hate relationship with human health because, on one hand, it is one of the basic building blocks for the body, and on the other, it is seen as a nemesis that contributes to unsightly weight gain and, in excess, has been tied to a number of adverse health effects. Obesity has long been thought of as a risk factor for prostate cancer, as well as for disease recurrence post-treatment. As dietary fat is considered a primary contributing factor in obesity, researchers are starting to turn their attention to how a high-fat diet may increase one’s risk for prostate cancer. 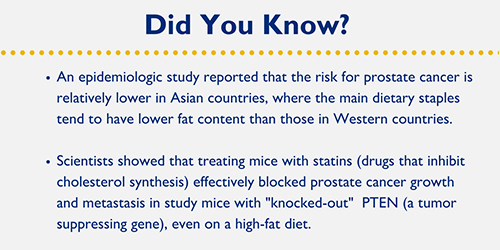 An epidemiologic study reported that the risk for prostate cancer is relatively lower in Asian countries, where the main dietary staples tend to have lower fat content than those in Western countries. This same study also revealed that men who emigrated from Asian countries to the United States and thereafter adopted a Western diet have an increased risk of prostate cancer. However, these results are only correlative and therefore do not provide a direct cause evidence for the role of fat in prostate cancer. Conversely, it is well-established that the gene PTEN is a critical tumor suppressor gene that plays a role in prostate cancer, and mutations in this gene have been identified in as many as 70 percent of prostate cancer cases. In animal models, loss of PTEN is sufficient to promote prostate cancer growth, but does not drive metastasis (spread of cancerous cells to other parts of the body outside the primary tumor location). To date, there is no established mouse model for prostate cancer where the disease develops spontaneously. However, a research group from Harvard University recently sought to improve upon the PTEN knockout mouse model in order to find a better way to recapitulate how this cancer behaves in actual patients. They did this by inactivating (or, as scientists call it, “knocking out”) not only the PTEN gene, but also another gene called PML, which has previously been shown to play a role as a tumor suppressor. To their surprise, not only did the double-knockout mice develop prostate cancer more quickly, but they also developed lethal metastatic tumors. Additionally, they found that the metastatic tumors in the PTEN and PML knockout mice contained increased levels of fat, due to the inappropriate activation of genetic pathways that are involved in fat synthesis. This observation suggested that fat may play a critical role in metastatic disease progression of prostate cancer. They went on to change the animals’ diets from their regular diet to a high-fat diet. They found that on the high-fat diet the PTEN and PML knockout animals displayed even more aggressive metastatic disease. What was particularly surprising about this finding was that when they changed the diets of the PTEN knockout mice (which on a regular diet do not metastasize), they developed metastatic disease. The group also showed that treating animals with statins (drugs that inhibit cholesterol synthesis) effectively blocked prostate cancer growth and metastasis in both the single- and double-knockout mice, even on a high-fat diet. This is particularly interesting and exciting for the development of potential new therapy options as it provides mechanistic evidence supporting the use of statins to treat prostate cancer. There are already numerous clinical trials investigating the use of cholesterol-lowering drugs in prostate cancer treatment regimens. Ironically, limited information is generated from clinical trials, and there are still many unanswered questions regarding the beneficial role of statins in prostate cancer. For example, the appropriate duration of time to use statins, the long-term benefits and corresponding risks, as well as the optimal dose, still need to be further investigated. Therefore, much effort is required to consolidate current understandings and determine future strategies for how researchers and clinicians can work together to effectively exploit fat metabolism as a means to treat metastatic prostate cancer. Learn more about prostate cancer and prostate health in our health library. 3 Comments on "The F-Word in Metastatic Prostate Cancer"
Thank you for sharing this interesting information. I am curious about the type of dietary fat used; animal-based or plant-based. We are all aware that all fats are not created equal. For example eating fried foods vs. eating an avacado or nuts will have a very different impact. I hope the type/source of fat was included in the study details to avoid the fear of eating healthy fats in our diet. There is adequate evidence to support use of healthy fats in our diet for optimal health. Thank you for sharing this information. I would be curious to see what the prostate cancer rate is among men eating a Mediterranean diet. These diets tend to be heavier in fat however not the fats that are typical of the Standard American Diet. There is definitely room for further studies in this area. They have use lard and soybean oil. Teklad Diet TD.06414 diet. Very interesting.